This is how Google Local Service ads appear on desktop. It’s common knowledge that websites such as Angie’s List® and Home Advisor℠ vet local service providers for their members. Now it appears that Google may be attempting to cut out the middleman by providing their own screening service and listing businesses at the top of Google pages. Google has rebranded their Home Service Ads as Google Local Service Ads in order to expand their program to services that occur outside of customers’ homes. These ads appear at the very top of Google pages before other ads and organic results. Qualified businesses featured in these ad buckets will also receive the notable Google Guarantee badge. 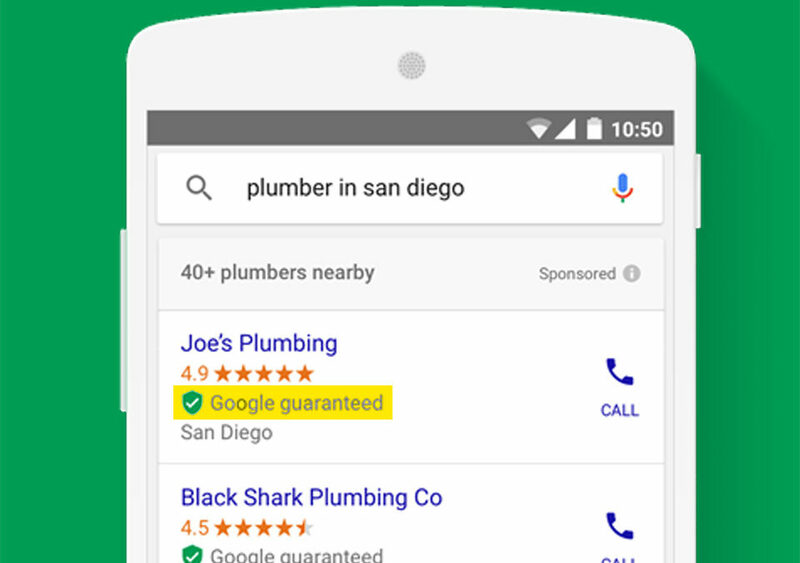 The Google Guarantee badge is a green check mark that appears next to your Local Service ad. Not only does it give shoppers the impression that you are a reputable business, but it also means that you are covered by Google’s quality assurance coverage. If a customer is unsatisfied with work quality, Google may refund up to the amount paid for jobs booked through Local Services ads, with a lifetime cap for coverage of $2,000. This means that customers can rest assured that when using Google to find a local service, they are protected from scammers. Google’s Local Services ads are different than Paper Per Click (PPC) ads and require a separate budget than Ad Word campaigns. Just like Home Advisor℠ and Angie’s List®, advertisers are charged for each legitimate lead received via the ad, not just clicks. The price may vary depending on the location, job type, and type of lead received, but the lead received will count towards a budget. Valid leads include text messages, phone calls, voice mails, and missed calls. If the caller has the wrong number or is a spam caller, don’t worry! Google will recognize the lead as invalid and your account will not be charged. So how does all of this work? Businesses can choose from a list of services for their specific industry. Ads will appear when the search criteria is met. Unlike Ad Words, which show for specific keywords, Local Service Ads show up for certain categories. This means that you can’t select exactly what your ads will and won’t show up for, but that may be okay since you aren’t actually paying per click. If a shopper does click on your ad, they will be brought to a page with only your listing without your competitors. If you meet the criteria, you will also have to pass Google’s advance verification, which is a screening process to make sure that your business is not only relevant and useful, but also trustworthy. Through this, Google hopes to reduce fraud and improve the overall experience for customers who use their platform to find services.